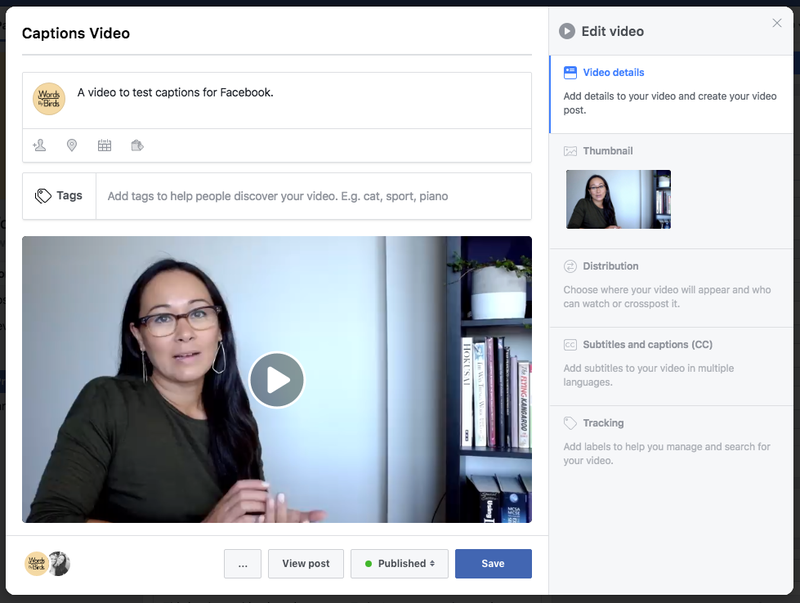 Do you use Facebook video captions? More than 500 million – that’s half a billion – people watch videos on Facebook every single day. That’s a heck of a lot of cute animals, funny pranks and Tasty recipes. But if you’re on a train or plane or sitting in a quiet waiting room, it can be super awkward watching a video with the sound turned on when you don’t have headphones, and that especially goes for UNILAD videos. No one wants loud video playing from their phone while they’re standing in line at the supermarket or sneakily watching a clip during a boring meeting. Sound is usually an essential ingredient of video. It provides context, narration, and can sway a user’s emotions when you add just the right music. However, according to Digiday, 85% of videos watched on Facebook are played without sound. Facebook videos autoplay without sound, and marketers across the board have found that very few opt to turn the volume on. This leads to a huge drop off of viewers for videos. Without sound, it’s impossible to know what’s actually going on. So how do you capture the silent majority with your own videos? With one very useful technique: closed captions, commonly referred to as Facebook video captions. Captioning can increase average video view time by as much as 12%, according to Facebook. When you spend time and effort creating videos, you want as many people to see them as possible. Facebook video captions will help get you results. Before we dive into captioning, let’s take a quick look at the benefits of publishing video content on Facebook. Audience: Facebook is the second largest trafficked website in the world and people watch over 100 million hours of video on Facebook each day. Mobile: 150 million active users access Facebook on-the-go. SEO: Facebook videos are visible in Google search. Sharing: people are about 10 times more likely to share, comment, embed and engage on video content compared to photos, blogs and other social posts. Conversions: you can include text and links with your videos, encouraging users to take an intended action. According to independent Fors-Marsh tests and Facebook, people can recall mobile News Feed content after seeing it for only a quarter of a second. The value of a video, and in particular video ads, increases with each passing second. A Nielsen study found that up to 47% of the value in a video campaign was delivered in the first 3 seconds, while up to 74% of the value was delivered in the first 10. 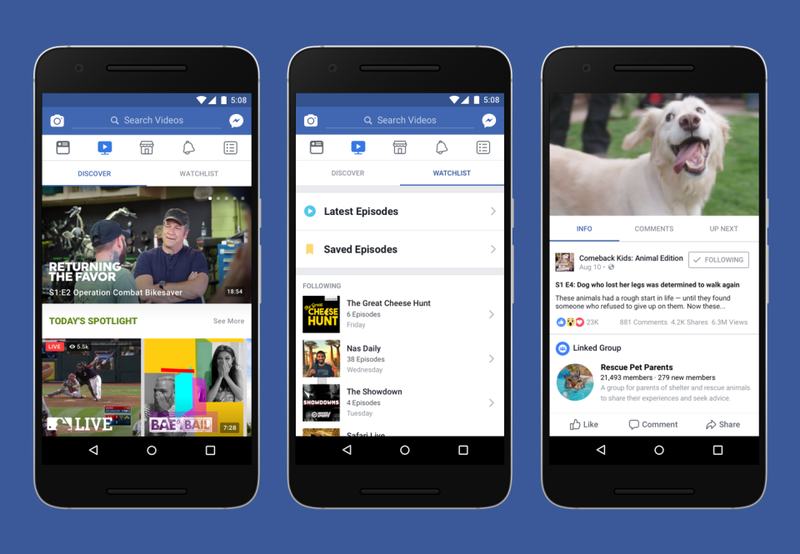 While Facebook has focused on video over the past few years, Watch is the platform’s first effort to brand video as a standalone property, according to Mashable. It’s even got its own name, logo and dedicated tab on Facebook. Plus, in case you missed it, Facebook is crushing Snapchat. And it won’t be long before Facebook overtakes a much bigger video giant – Google’s YouTube. Facebook is doubling down on video, which means content marketers and social media managers need to keep up and invest in more video content. According to a Cisco Visual Networking Index port, by 2019, 80% of all Internet traffic will be video. As consumption of this medium continues to rise, so too does the need for increased accessibility, i.e. ensuring videos always have closed captions. When Facebook first rolled out autoplay video it turned on sound by default. But people didn’t like this. Facebook research later found that people using their phones to access the platform preferred having the choice to opt in to sound. Further, when “feed-based mobile video ads” (i.e. videos you scrolling past in your Facebook feed) played loudly when people weren’t expecting it, 80% reacted negatively, both toward the platform and the advertiser. So Facebook dropped sound by default and autoplay without sound has been the norm ever since. With this tweak, Facebook has built a video ecosystem that doesn’t require users to turn the volume up. Most users’ News Feeds are now inundated with short videos and clips that feature text or captions narrating what’s being shown on the screen. While most videos feature narration and/or music, the goal is to make it as easy as possible for people to consume videos without any sound. Let’s look at an example that shows just why captioning is so important. Lip readers might be able to work out what I’m saying in the first video. But isn’t the second video far easier to consume? If you’re like me, I scroll straight past videos on Facebook that don’t have captions. Especially when I grab my phone first thing in the morning and I’m not awake enough to deal with sound! Fortunately, Facebook has a hand built-in captioning tool that takes no time at all to set up, so you can add captions and subtitles to your videos in no time. Facebook’s captioning tool is really cool. At its core is the platform’s voice recognition software, which works out what you (or someone else) is saying and when. Then it transcribes the words and gives you a template matched with timestamps that you can then edit. A modal will appear giving you a bunch of editing options. Click on “Subtitles and captions (CC)” on the right-hand side. 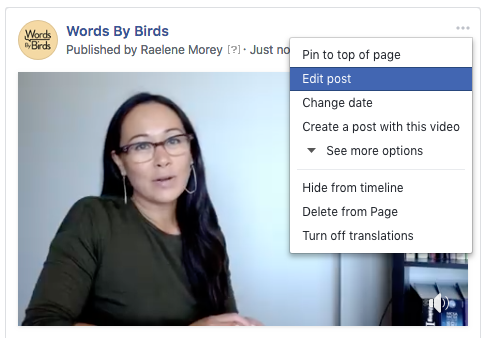 On the next screen, you can either upload your own .SRT file if you want to sort out Facebook video captions with a third party tool, or click on the “Edit captions” button to edit what Facebook has transcribed. Next, like magic, you’ll then see another modal, this time with transcribed text from your video matched with timestamps. When you hover over the transcribed text, you’ll see it light up so you can make edits. You can also edit the timestamps, trash any captions that are unnecessary, and preview small segments of your captioned video. It’s a good idea to thoroughly check that the text matches what’s actually being said in the video. Before I edited the text above, there was a little gobbledygook. I’m sure Facebook will get it working perfectly one day! Now, your video is ready to watch on mute, making it vastly more watchable for people who don’t like to have sound enabled and people who have hearing disabilities. Closed captioning can also be added to live broadcasts, but this is a lot trickier to set up. Check out Facebook’s closed captions how-to guide for more information. You don’t have much time at all to grab someone’s attention on Facebook. As users scroll through their feeds, they’ll merely glance at your video before making a split second decision as to whether they’ll watch it or not based entirely on your thumbnail. With people’s growing control over what videos they watch and for how long, the faster you’re able to communicate your messages in a video – and especially video ads – and capture the viewer’s attention, the better. For more on Facebook video marketing, check out Grow Your Reach Today With These Facebook Video Marketing Tips. Here are some tips to keep in mind next time you create a video for Facebook. Filming on the fly can be fun, but it’s best to plan ahead and thinking about what would work without sound. So imagine you’re shooting an old-fashioned silent movie. Think about the story you want to get across to your viewers, the message you want to convey, and how you can do it all visually. If you can’t escape the need for some kind of language or narration, plan ahead for Facebook video captions. Make sure there is room at the bottom of your shots for captions. It’s critical to connect with your viewers and capture their attention right away. Facebook research has found that 65% of people who watch the first three seconds of a video will watch for at least ten seconds and 45% continue watching for thirty seconds. This means your video thumbnail and title are two of the most important elements of your video. Brand colors, themes and imagery can quickly help people visually connect a video with a particular brand. Likewise, lifestyle and product shots and recognizable or famous spokespeople can pique a viewer’s interest. Since mobile users usually watch videos without sound, make sure you express your message visually. In one study of Facebook video ads, 41% of videos were essentially meaningless without sound. Using Facebook video captions, logos and products can help communicate a message more effectively, even in silence. There’s no right or wrong way to build a brand with video on Facebook, so experience and test to understand what works with your audience and what doesn’t. If sound is absolutely crucial for your video, simply ask users to turn on their sound. But make sure the first few seconds of your video are highly visual so you’ve got their attention before asking. For marketers and social media managers who want to understand how people are engaging with their videos, Facebook provides metrics that let you see the percentage of people who have viewed your videos with and without sound. To access this feature, go to the “Insights” tab for your business page, click on “Videos” and select the video you want metrics for. When you click on “Video views” you’ll see the percentage at the bottom of the modal. Now for some inspiration. Let’s take a look at some brands that are nailing Facebook video captions. If you haven’t come across one of Buzzfeed’s Tasty videos, you must be living under a rock. Their short and highly visual recipe videos are played in fast forward. This tactic is great for three reasons: it saves viewers time, users know the video will be over soon so they stop to watch, and it’s entertaining. This particular video is super colorful with flashing captions within the first 3 seconds, on top of the fact they’re making a rainbow cake. Sound isn’t required to watch these videos or understand exactly what’s involved in each step-by-step demonstration. This Airbnb video doesn’t need sound to get viewers imagining how they, too, could escape the hustle and bustle of everyday life and find peace and tranquility at a yoga retreat. In contrast to the Tasty video above, what makes this video is effective is the slow movement of the camera in time with the slow movement of the yoga students. And when you do turn the sound on, there’s calming birdsong. 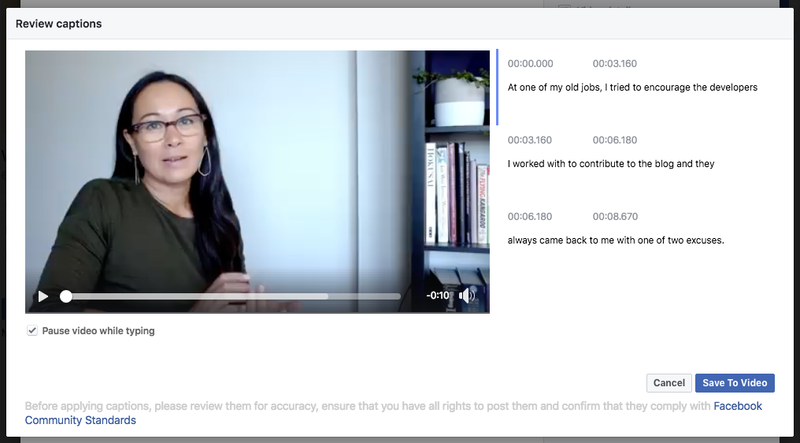 With Facebook focusing its efforts on video, and more people using their mobile devices to access social media, closed captioning provides a relatively easy way to make your videos more watchable and more accessible to a wider audience. With the auto-captioning walkthrough above, you now know all the steps involved in adding captions to your videos. Don’t forget to track your analytics and check Facebook Insights to see metrics for your videos, in particular, how many views you’re getting for videos with and without sound. The post Facebook Video Captions: How to Use Them to Increase Your Video Views appeared first on Revive Social.